Boosting your company's profits was the main goal that Ingersoll Rand had in mind when it designed the revolutionary UP-Series line of integrated rotary screw air solutions. The UP-Series is more than an integrated air system, it's a complete air solution designed to maximize the key drivers of profitability in today's business. 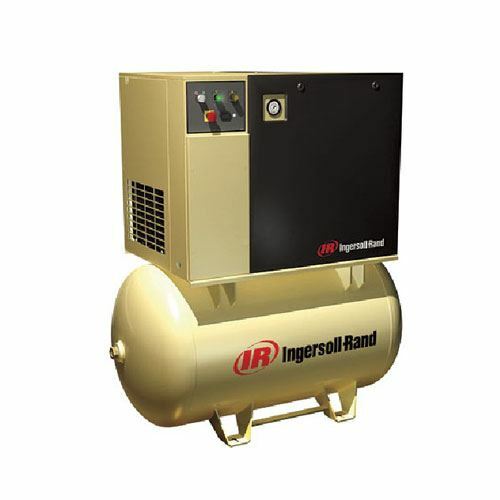 Ingersoll Rand is known throughout the compressed air industry as being the top air compressor manufacturer in the United States. The UP6 rotary screw air compressor is designed to create maximum uptime for real world advantages within your shop. The UP6-15C-125 comes standard with an air cooled aftercooler to help reduce water, oil filters and air separators to reduce oil downline, and an ASME coded receiver. Integrated Compressor module: The airend and piping system has been integrated into one module. This eliminates leaks and pressure loss by combining spin-on oil and separator cartridges into one package with the airend. Increased Efficiency: Industry leading performance delivers more air for less horsepower, saving thousands of dollars per year on energy. Installation Flexibility: Whisper quiet operation allows for installation closer to point-of-use, reducing costs and ensuring a better & safer work environment. Simple Diagnostics: Visual indication of operating status, hours & fault warnings for ease of operation and reduced downtime.